Whereas before we didn’t have need for coffee on-tap, automatic coffee machines are the latest kitchen necessity. In the past, we used to have conversation, now families can sit quietly in the same room and concentrate on their own self-swiping research – last night I window shopped for a car, my wife was caught in message banter with her sister and my children were absorbed in a virtual reality game on the planet Zorg where parental intrusion was forbidden. All quiet, no need for discourse – except we didn’t need electronic aides in the past – newspapers, phones and books provided all of that. It’s not that I’m anti-change and luddite in my outlook but there are some “innovations” that make me LOL! 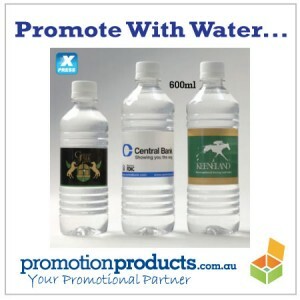 Like promotional water – really? How can you take the source of life and market it like it’s something absolutely fundamental? Which it is…..of course. Water is water, right? Well I suppose that would be a fairly simple and short conversation with the residents of an Indian slum or the favelas of Rio…..we’d have to eat humble pie and pull our heads back in. Of course it’s the packaging and the large cylindrical branding space on a vessel presenting a 360 degree surface that is the hook here. Print on recyclable paper and brand on recyclable plastic. What’s not to like? It’s something our forebears would scoff at…but it was staring them in the face all the time. This entry was posted in Australian, Desk and Office, Fun and Leisure, Giveaways, Promotional Products and tagged branding, catering, conferences, events, giveaways, outdoors, restaurant, trade shows by admin. Bookmark the permalink.